SAN ANTONIO -- All of a sudden the San Antonio Spurs don't seem so simple anymore. They're the 2014 NBA champions, sure, but their significance is far broader. By thoroughly dismantling the Miami Heat in five games, by winning their fifth championship since Tim Duncan and Gregg Popovich got this thing going in 1999, they're forcing us to recalibrate our definition of a superteam and to rearrange the hierarchy of modern great franchises in the NBA and all of sports. They're the best NBA team since Michael Jordan's Chicago Bulls in the 1990s. Yes, the Los Angeles Lakers have also won five championships in the time since Jordan finally dropped his shooting hand at the finish of the 1998 Finals. But the Spurs get the edge in continuity and longevity -- "the span," as Duncan kept calling it. The Spurs have made the playoffs for 17 consecutive years. They've won at least 50 regular-season games in every one of those years except 1999, when the lockout shortened the entire season to 50 games. AP Photo/David J. Phillip Manu Ginobili and Tim Duncan relished the franchise's fifth NBA title. Duncan and Popovich have two more championships than the Tom Brady-Bill Belichick New England Patriots. And while Derek Jeter and the New York Yankees have as many championship rings as Tim Duncan, dating back to 2006, Jeter has also had more managers and has reached the World Series only once since 2003. Back to basketball: Duncan, Tony Parker and Manu Ginobili outlasted the Shaq-Kobe Lakers, then reached two NBA Finals since the last time Kobe and Pau Gasol won a playoff game. The Spurs quelled the Seven Seconds or Less basketball revolution in Phoenix. And now they have exacted vengeance on the Miami Heat, the only team that could claim a victory over them in the NBA Finals. Seven years after their most recent championship, long after we figured they were through, the Spurs sprinted to the finish. By the time the clock hit zero on their 104-87 victory in Game 5, the Spurs had outscored the Heat by 70 points over the course of the series, the biggest point differential in NBA Finals history. So which team was the superteam again? It sure seemed like the Boston Celtics and then the Heat had found the formula in the years since the Spurs last won it in 2007. Quickly assemble a team of established veterans, grab all the magazine covers, then pop the champagne. The Spurs struck a blow for scouting and development. And patience. Most of all, patience. They've kept the core together for more than a decade. "The alternative wasn't any better," Spurs general manager R.C. Buford said. "These guys have been a part of our organization. They'll determine when they're done here, I would hope." Notice how neither the agonizing seven-game loss to the Heat last season nor the stunning first-round upset by the Memphis Grizzlies in 2011 caused a massive upheaval in the Spurs. Three years later they still have half of that 2011 team. And one of the departures, George Hill, was traded for the guy who won the Bill Russell Award as the 2014 Finals MVP, Kawhi Leonard. Definite upgrade. The fact that the Finals MVP was open to debate until the moment Mr. Russell himself came on stage to hand out his namesake trophy speaks to the Spurs' balance. It could have been Boris Diaw (whom they picked up as an overweight castoff from the Charlotte Bobcats in 2012, by the way) even though he never had a double-digit scoring game in the series. It could have been Duncan, who happened to notch his NBA record 158th playoff double-double during the Finals. But it was Leonard who went for 20-plus in each of the final three games, who provided the athleticism the Spurs needed, who had Duncan gushing "I'm honored to be on this team right now" as if Leonard, not himself, was the franchise cornerstone. Trying to pick the MVP of the 104-87 Game 5 clincher was almost as tough as choosing a Spur for the series. Leonard had 22 and 10 rebounds. Patty Mills hit five 3-pointers, scored 17 points and made a strong bid for the honorary Tyronn Lue Award, which goes to the upcoming free agent who earns the biggest contract with his play during the NBA Finals. But this game really belonged to Ginobili, who resurrected the Spurs after they fell behind by 16 points at the outset. At one point, when the Heat looked like they were going to make this a game and quite possibly a series again, Ginobili came in and quickly produced two of the Spurs' first three baskets. The second, a 3-pointer, resulted in a Spurs' timeout and a big Ginobili fist pump. The Spurs were on their way back. "We were a little impressed, intimidated by the way they started," Ginobili said. "You know, LeBron being a bull and scoring 17 points. So I felt like I had to try to push it and be a contagious guy. It felt like each game in these playoffs -- at times each quarter -- belonged to a different Spur. It's another reason this team is multifaceted. This night could be about Leonard and San Antonio's future, or Ginobili and a link back to the past, to his arrival in 2002 that started the most successful playoff trio (in terms of games won together) in NBA history. Also, the four championships that Duncan, Parker and Ginobili have won as a group surpass any combo of more than two players since Magic Johnson, Kareem Abdul-Jabbar, Michael Cooper and Kurt Rambis won four in the 1980s. Ginobili was the one who had to give up the minutes and the status to make it work, primarily coming off the bench as a Spur. "I don't think it was a big sacrifice," Ginobili said. "Maybe the first time it was a little painful on your ego, then you understand. And the way that we played when I got on the court, I started to feel, 'OK, this may be good.' Because when I get in, Tony and Tim were out and all the plays were for me. And I started to feel confident in that role. "I really believed Pop and the thought we were better like that. Once that happened. Now I'm a backup and I enjoy it and I don't even want to start." "We embody him," Buford said. "He's given us the personality. He and Pop and Tim and Tony are a great fit, but we're the beneficiaries of what he's given us." What's next? We can't simply say, "See you next June" because Duncan and Popovich have yet to formally declare they'll be back next season. Then again, they haven't said they won't be. "You watched them out there," Buford said. "They committed to each other this year. I don't see anything that leads us to know anything other than they can be proud of the commitment they made to each other and they'll decide when it's over." Then it will be up to us to decide where they rate among the NBA annals. It sure is getting tougher to keep them off the upper shelves. MVP: When the Spurs needed a spark in the first half, Manu Ginobili was there to provide it. Except for garbage time, Ginobili single-handedly outplayed Miami's bench. He put San Antonio in control of the game with his scoring and ability to create shots for others, finishing with 19 points and four assists. X factor: It seems almost unfair to relegate LeBron James to a footnote, but against these San Antonio Spurs, he could hardly make much of an impact. He was the best player in the series, but without help from his teammates, James stood no chance of fending off the Spurs. That was ... thorough: There can be no doubt about San Antonio's dominance and championship credentials. The Spurs trounced the two-time defending champion Heat, doing so while playing some of the most beautiful basketball in NBA history. Congratulations go out to the Spurs. They earned this. Kawhi Leonard, Spurs: Their 22-year-old NBA Finals MVP put his stamp on this series. Leonard had 22 points and 10 rebounds for the Spurs, coolly draining shots while his teammates found their footing early on. San Antonio added this title to the ones the Spurs won in 1999, 2003, '05 and '07. Heat reserves: Of course the Spurs won this more than the Heat lost the series, but the Heat's bench that stepped up so many times in the past two title runs had nothing to give for much of the series. The Game 5 defeat was a fitting end. "It makes last year OK."
-- Tim Duncan, on the Spurs' title making up for last season's disappointment. 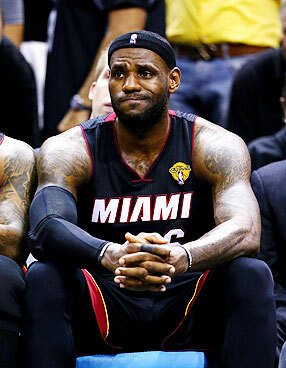 Andy Lyons/Getty Images LeBron James ended up watching the uneventful end of the 2014 NBA Finals from the bench. What's next for King James, who can become a free agent this summer? Kawhi Leonard is only the fourth player in NBA Finals history to score at least 20 points in three consecutive games before turning 23 years old, joining Alvan Adams (1976, four games), LeBron James (2007, three games) and Tom Heinsohn (1957, three games).